The supreme rule of this game is to stifle arguments against evolution—any way you can. Thus, evolutionary ‘science’ is not necessarily a search for truth, as we used to be told, but a game in which scientists try to find naturalistic causes, even for the origin of the universe and all in it. 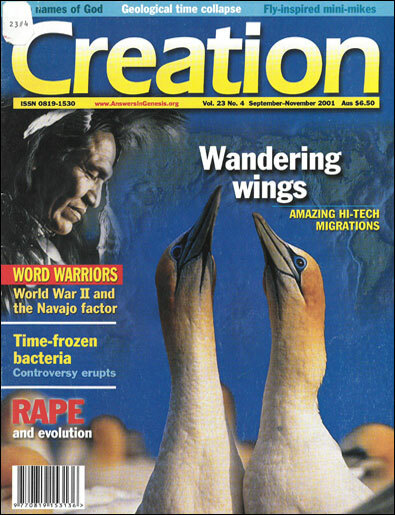 At the conclusion of a creation/evolution debate in which I participated some years ago, a professor in the audience said, in effect: ‘You may well be right; special creation is probably the truth and evolution is wrong. Nevertheless, evolution is science, and creation is religion, so only evolution should be taught in schools.’ Not every evolutionist is as frank, but this really is the game they play. Even though scientists never cite any real scientific evidence for evolution, doctrinaire evolutionists insist there is such evidence, because any alternative is outlawed by the rules. A third rule of this game of evolutionary science seems to be to insist that all scientists, by definition, are evolutionists. Even though thousands of creationists with post-graduate degrees in science are pursuing careers in science, these are commonly ignored or ridiculed or even denied status as scientists by the evolutionary establishment. The game plan is that, no matter what scientific credentials they have, scientists cannot be creationists without forfeiting their status as scientists. In fact, many think it would be better not to let creationists become scientists at all. When I was an engineering department chairman at Virginia Tech, I asked the biology professor in charge of the doctoral program in that department whether a creationist student could get a Ph.D. degree in his department. The answer was ‘No!’ No matter how outstanding his grades or dissertation or even his knowledge of evolutionary theory, if he did not believe in evolution, he could not get the degree. That opinion, by an Iowa State University engineering professor, was published by the main US organization dedicated to fighting creationism—an organization whose establishment was funded by the Carnegie Foundation. This is, indeed, quite a game some people are playing! Dickerson, R.E., The Game of Science, Perspectives on Science and Faith 44:137, June 1992. Lewontin, R.C., The Inferiority Complex, New York Review of Books, 22 October 1981, p. 13. Johnston, G.S., The Genesis Controversy, Crisis, p. 17, May 1989. Patterson, J.W., Do scientists and scholars discriminate unfairly against creationists? Journal of the National Center for Science Education, p. 19, Fall (Autumn) 1984. Frazier, K., Competence and Controversy, Skeptical Inquirer8:2–5, Fall (Autumn) 1983. Lewis, C.S., Private letter (1951) to Captain Bernard Acworth, one of the founders of the Evolution Protest Movement (England). Cited by evolutionist Ronald Numbers in his book, The Creationists, University of California Press, California, p. 153, 1992. Reprinted and condensed with permission from Acts and Facts, Institute for Creation Research, San Diego, California.